In the accident I somehow bounced out of control and landed on my head. When I was able to move my extremities I believed that I was ok. It wasn't until years later after enduring extreme neck and shoulder pain and the progressive pain and loss of sensation in my hands that I realized that I had did a great deal of damage. I had ruptured two of the discs in my neck and they were causing pressure on my nerves and I eventually had neck surgery to remove the ruptured discs and have them replaced with cadaver bone and metal rods. I eventually ended up at the Courage Center in Minneapolis in a 3 week in-patient Chronic Pain Clinic. It was there that my world started to change. After much work I changed from a self-proclaimed couch potato riddled with pain to ending up in Yellowstone working very hard and becoming the manager of the Mammoth General Store. Though I am relatively pain-free at this time stress, as with anyone, can be a physical enemy. With a change in management and new employees coming into the store and unexpected schedule changes I found myself, as well as others, in a position where stress can take a toll. Using with what I had learned at the Courage Center I took a deep breath, let out the stress and said to myself: "This is the situation, what are you going to do now?" Don't let the weight of the world consume you. Consume the world! I have been consuming a lot of snow lately. The weather has decided to stay in winter mode. This past week has alternated between rain and snow. Dunraven Pass did not open for Memorial Day Weekend as it has done in the past. At this time there is no opening date set. Sylvan Pass has only been open from 8:00 pm until 10:00 am because of avalanche danger. And Beartooth Pass did not open, either. On Thursday morning all roads in the Park, except from Mammoth to Cooke City, were closed because of snow and on Friday the road from Old Faithful to West Thumb to Lake was closed because of snow and ice. And on Friday a mud slide blocked the road from Mammoth to Tower. Winter will not stop. I did manage to take some time to travel to Lake on Saturday evening to see Patrick. He had been at training in Cody during the week and spent a few nights at his cabin in Wapiti. He had to wait until Saturday night at 8:00 to travel over Sylvan Pass to get back to Lake. On my way down I managed to see a grizzly just north of Roaring Mountain. Most of Sunday had snowflakes falling at Lake and Canyon. It wasn't until I traveled back to near Mammoth that I got out of the snow but there I was met with fog and haziness. More snow is expected for tomorrow. I have spent the past seven months in snowfall. What am I going to do now? Enjoy the beauty of the snow. This I have no control over. If you were to look up the word talented in the dictionary a picture of Aaron would accompany the definition. Aaron calls numerous states 'home' but is originally from Ohio. He has spent the last 10 years as a classically trained regional stage actor and his performance list includes A Christmas Carol (played Scrooge twice and the Ghost of Christmas Future once) and A Mid Summer Nights Dream. He has also performed in educational theater and has a a degree in Theater from Cleveland State University. Not only can he act but he is an accomplished pianist. He is also planning on moving to Tiawan after his stint in Yellowstone to teach English. He spends his time in Yellowstone hiking on his days off. Come meet Aaron at the Adventure Store! And that friendly greeting he will give you will not be and act! And I thought I would include a picture of the grizzly that I saw the other day south of Indian Creek. The crowds came to bid Judy a farewell at her reception yesterday. I didn't cry once (at least not on the outside). It was a wonderful gathering put on by the company. There are so many who are going to miss her. I headed to Lake via Craig Pass after the reception. The road south of Canyon has been re-opened for the weekend even though the pullout has been washed away and a large crack has appeared. It will be closed for repairs on Monday and will be closed for a few days. I decided to go to Lake using the south route since the road could be closed at any time if the condition of the road gets worse. I managed to see a grizzly by Fountain Paint Pots. Josh told me today that when he passed by there earlier in the day there were actually five grizzlies there but I only managed to see the one. I also had to hit the brakes by Pumice Point when a rascally pine marten dashed across the road and further on a coyote made its way over the road. This morning Aaron came out of the side door from our dorms to find a fox with a squirrel in its mouth. Later I watched a pine marten scurrying around by the loading dock. Wildlife abounds. And on my final day at the Adventure Store it has been snowing. At this point all I can do is laugh. And eat the cookies that Ranger Chris brought me. Move #7 has commenced. It is not a 'moving day' but a 'moving process'. A moving process that actually started last week. I have been moving boxes up and down the stairs from the Adventure Store to my apartment in Mammoth.....the apartment I just moved from 1 1/2 months ago. This will be my final move, of which I am glad, but along with the move comes the realization that I will be further away from so many people that I have come to know over the past couple of years. Some of my old comrades have come back to Canyon but I still have plans to stop in and see them from time to time over the summer. And they plan to stop in and see me. So all is good and I am terribly excited about my job at Mammoth. The winter has been hard on areas of the Park. Sylvan Pass has been closed a few times because of an avalanche and unstable snow conditions. The Grant Visitor Center had a roof collapse last week and tonight the road gave caved in just south of Canyon. The road will be closed for a few days for repairs. It gave way in the same spot it has before, my first experience with that was two years ago. As I travel to Lake daily I am lucky that I was on the Canyon side since it is a two hour drive from Lake to Canyon via Old Faithful and Madison. I have been extremely busy with work as well as a couple of farewell gatherings that are being planned for Judy. I will be going to West Yellowstone tomorrow for a company gathering and then Sunday night in Gardiner with the Mammoth gang. On Monday night the Adventure Store will be hosting a Redington party where we will be showing off our new Redington line of apparel. I was able to invite numerous people for our party, Delaware North employees as well as NPS employees. We will be serving wine and snacks and all the Adventure Store employees will be sporting some fine Redington apparel. We are all looking forward to the evening. I was hauling a load of my belongings to Mammoth this afternoon and found myself in my first bear jam for 2011. South of Indian Creek a grizzly was out in the open digging away. I snapped a couple photos as I waited for the line of cars to move. Interestingly enough Patrick was at meetings in Mammoth during the day and on his way back to Lake he came across the jam after I came through and got to do what he loves most: work the bear jam. He answers the visitors questions, keeps them safe, keeps the bear safe and keeps the flow of traffic flowing. There was also a grizzly mauling by Big Sky last week. Two hikers were hiking a trail when an elk came running by followed by two grizzlies. The grizzlies decided to forget the elk and one of the grizzlies went after the hikers as they tried to climb a tree. No life-threatening injuries (thank goodness!). The snow has melted considerably yet winter weather is still in the area. Yellowstone and the surrounding areas are currently in a Winter Storm Watch, Warning or a Winter Weather Advisory. Light snowflakes fell as I crossed from Norris to Canyon this evening and I released an audible sigh at the sight. June is less than two weeks away yet I still keep my ice scraper on the passenger side floor of my car because 9 out of 10 mornings I am still grabbing it and scraping my windshield. There are times in Yellowstone when you can find yourself coming much too close to Yellowstone's wildlife. Take last Thursday evening for instance. I was laying on my bed totally captivated by the movie Shrek 4 when I decided to get up, cross the floor, and then come back to the comfort of my bed only to find that I had a bed companion. This spider was relaxing it's weary eight legs on my pillow. Eeeww! I took a picture of it so I could find someone who could identify it (I still have to do that). It scurried away before I could capture it. I have named him Gary and I know Gary is somewhere in my room watching me with multiple little spider eyes. I find no comfort in that. Last Thursday and Friday I had Manager Meetings in West Yellowstone. I got to spend both of those mornings taking a nice leisurely drive through the Park with expectations of seeing some wildlife. With camera by my side I headed out both mornings. I saw very little but I did manage to find some bison calves by the Madison River west of Norris. I have now seen a total of seven calves, a pitiful few compared to previous springs. But the ones I saw were small and wonderful. I found these two bounding and leaping in play on a snowy and rainy Friday morning. The weight of the snow was too much for this structure. The repair garage at Fishing Bridge collapsed last week. My weekend included meeting up with old friends. Jackie made it back to Yellowstone to start her third year at Canyon General. I picked her up in West Yellowstone Saturday morning and we had a grand day shopping in Bozeman. I am sooo glad to see her again. Welcome back, Jackie! Friday night I made my way to Wapiti to meet up with Patrick at the cabin. I found a moose 4 miles west of Wapiti grazing off the side of the road. I could actually hear it munching on the vegetation. I took a picture but with the light fading all I managed to capture was a silhouette and two glowing eyes. Luckily I spotted it again Sunday afternoon as we headed back to the Park. She was further from the road and partially hidden. The road from Wapiti to the east entrance was a wildlife bonanza: elk, bison, moose, bighorn sheep and deer. What a wonderful and scenic drive. The weather remains cool with rain and snow lately. We've experienced a couple of power outages this weekend but nothing that lasted more than an hour. The snow has continued to melt in front of the store but it still towers over my head. I introduce Jerry who comes to us from Clearwater, Florida. An avid fisherman who once spent everyday for 5 months fishing in Alaska, is a perfect go-to person when it comes to fishing questions and advice. Though he has been to over 20 national parks this is his first time being employed in one. He spent over 25 years being in real estate and has a degree in business management. Jerry is here and ready to help you with all your outdoor needs. Nancy also comes from Clearwater, Florida. And this is because she has been married to Jerry for 34 years. She is one of the Adventure Store Floor Supervisors and has spent 15 years in retail, including being a District Manager for Claires. Nancy and Jerry have spent the past couple of years RVing and seeing the country with their cat, Shadow. This is her first time in Yellowstone and has come to love the snow. Nancy and Jerry have a son, Kevin, who is a private security contractor in Afghanistan. Nancy is ready at the door to greet you some come on in and say hi to Nancy. Leapin' Lee is back for a second year at the Adventure Store. She moved to Montana in 2009 after spending 32 years as an Ophthalmic Technician in Charlottesville, Virginia but is originally from southern California. She is having a great time working in the Park and is looking forward to coming back in the future. Lee always has a warm welcome for everyone and is always ready to help serve up some chili. Kem is here from Fort Worth, Texas and is our EDR cook extraordinaire. She spent 8 1/2 years in the Coast Guard as a cook and in the Navy as a supply clerk. She has 12 brothers and sisters, whom she cooked for and where she found her love for cooking. This is her second season working in Yellowstone (Tower and Adventure Store last year) and after she finishes cooking for us at the end of this week she will move to Lake where she will be the EDR Manager. With her Taste of Home cookbook she serves up some great cuisine for us. She keeps us fed and happy. Thanks for a job well done, Kem! And thanks for those great chocolate chip cookies. Yummy! It was a week ago that I got the news. 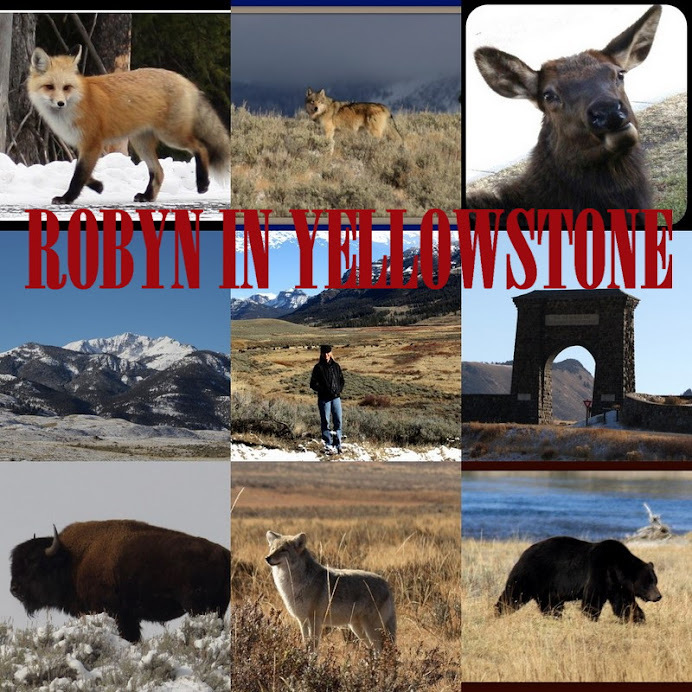 My great friend, Judy, will be leaving Yellowstone. She has decided to move to Colorado and spend more time with her family. I have to say I am extremely happy that she and her family will be spending time together but the selfish side of me screams "Don't go!" But I understand and support her and I wish her great times with those she cares about and with those who care about her. We won't forget you, Judy! You will always be one of the Three Amigos! or Stooges! And what happens now? Well, it appears that I have large shoes to fill, or a large taco scoop to handle. I received the news today that I will now be the manager at the Mammoth General Store. I will be leaving my beloved Yellowstone Adventures store and take my new post in Mammoth on May 23. I will be coming to a store that I am very familiar with since I work there in the winter but now I will be there permanently. I am extremely thrilled that I have been chosen for this position and I am sure I will be very happy being there year-round. The future looks bright! And what about the Adventure Store, you ask? Good news there, too. Andrea will now be managing the Adventure Store instead of the General Store at Bridge Bay. Congratulations, Andrea! So with the bitter comes the sweet. Driving from Livingston to the Park's north entrance can be a driving obstacle course. There are large herds of deer, elk, bison and bighorn sheep next to and on the roadway. The area by Dome Mountain is especially treacherous as huge herds of elk congregate in that area in the evening. I found these two bighorn sheep on the road in Yankee Jim Canyon along with several others who would bound over the guardrail and cross the road. Just north of Gardiner elk and bison graze on the sides of the road as strings of vehicles in front of me gleam red with their brake lights blazing as they pass the herds. Coming back from my Saturday trip to Bozeman on I made a quick stop at the Adventure Store before continuing on the Lake. I finally got a glimpse of the fox who has been leaving its prints in the snow in front of, around and on top of the store. He made a quick glance my direction before heading up our snow corridor to the front of the store. I swung into the Mud Volcano area where I found a coyote standing in the parking lot. He was rather agitated and his hair stood straight up on his back. He looked intently up the hillside. My eyes followed in the direction of his stare and I saw a second coyote sitting on the hill. Then I noticed a third coyote weaving between the posts below the boardwalk. The two finally trotted off behind the steam of the thermal feature and disappeared from sight, the one sporting his spiking fur coat. And with my day filled with wildlife close encounters (all encountered from the comfy interior of my vehicle) I was completely thrilled to have it close with one last wildlife viewing........my first grizzly bear sighting for 2011. Just past Mud Volcano I watched as this grizzly nibbled on something and then wandered around. Dusk was approaching so its viability was limited but I was excited none the less. Sunday Patrick and I made our first trip over Sylvan Pass in a vehicle for 2011. Our last trip over was in January and it entailed a snowmobile ride. The walls of snow were rather high and it can be a very intimidating feeling to look up the mountainside and see the thick layer of snow above all the while hoping that wasn't going be the moment that it would all start sliding down. While most of the pass has been plowed to a two lane width there is a section that is only one lane wide. It is on a curvy section and as we drove we hoped that we wouldn't come upon another vehicle heading in the opposite direction. Someone would be backing up a very long ways. We saw no one. And how does someone end a nice weekend in Yellowstone (that someone being me)? You see more wildlife. This morning at 6:00, just south of Mud Volcano, I came across three grizzly bears eating a bison carcass. One would eat while two others stood off in the distance. Suddenly one of them ran forward and chased off the feasting bear. The second one chewed and gnawed and ripped and gulped for awhile and finally got himself a nice hunk of bison and ran off up the hill with it. That is when I also happened to notice that two coyotes were also lurking in the trees waiting for their turn at the carcass.